I've had two compliments recently about Tony Korn, our U.S. TravelScoot provider. Tony is a standup guy. I have a 'short' in one of my lithiums and he is replacing it. I don't know if other people have had much contact with him but he is a good provider of services and I appreciate his spirit. It is a privilege to do business with someone of this caliber. The second came in a much more unusual way. I was coming out of Target last Saturday and a man chased me out of the store, yelling "ma'am, ma'am!" I knew immediately it was about the TravelScoot because this is FAR from the first time it's happened, but instead of wanting information about my scooter, he wanted to thank me. Many months ago I was in a medical complex and a couple flagged me down for information about the TravelScoot. They were the daughter and son-and-law of the man at Target. My friend Rhonda ended up demonstrating the TravelScoot for the wife of the man at Target. When Rhonda and I do this, we usually don't know what happens afterwards, so it was nice to find out that they'd bought the TravelScoot and had really been enjoying it. One thing the man told me was that they'd had something go out on the scoot and he had called Tony and Tony had immediately sent him the parts he needed. He seemed quite pleased with the quality of service he received. That's been my experience too. Thank you, Tony! Vroom-vroom fits nicely in the back of a '97 Toyota Rav 4. I added a desk floor mat to protect the carpet. A frame of pipes held down with velcro (so it can be removed if needed) helps keep the front wheel from turning while loading/unloading, and a twist tie holds it in place while moving. I have a Lincoln MKX (the suv one) and recently had the lift installed. 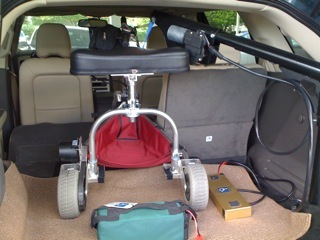 This is a photo of the back of the 2011 Lincoln MKX with the lift. I read a post on a fellow TravelScooter's blog that I thought you all would enjoy. Read it and discover how Juge's TravelScoot came to be known as "Bicicletta di Juge." It's a sweet story. Hello Elizabeth, I always enjoy receiving your e-mails. I recently moved from the Philippines to Las Vegas, Nevada. The first thing I wanted to do after buying a home was to purchase a car. I didn't want an SUV or any utility style vehicle. Fortunately, there was an auto show in Las Vegas just the time I was getting ready to make a purchase. I wanted a sedan, and did not want to fold the travel scoot or take off the front wheel. After seeing every sedan at the auto show, only 2 sedans satisfied this prerequisite. One was a Honda Crosstour, the other was a Toyota Prius. I opted for the bigger, more luxurious Honda. The car was made with a travel scoot in mind. It almost seemed like Mr. Huber and Honda synchronized for this perfect fit. When pulling up to the Vegas hotels and casinos, valets are always very impressed how simple, light and easy it is to remove the scooter in its upright unfolded position. Only requirement after it has been removed from the trunk is to put on the seat. I hope that this information is helpful to my other travelscoot buddies. I haven't purchased the hard golf bag recommended recently. It is on my things to do list and I eventually I will get one. Thanks for that tip! Funny you should bring this subject up as I 've been thinking about changing vehicles. Right now I drive a Toyota Highlander, which I do love but with gas prices hitting $4 a gallon I've been thinking about getting the new Prius V5 that has a larger cargo area then the Prius that my husband drives. I haven't made it to the dealer yet to see if the TS will actually "fit" but from all the pictures I've seen of this new model, it looks like it might. We can get the TS in a standard Prius with the back seats down and a bit of a tipping to get it past a low spot in the headliner. I cannot do this myself without hubby's help. Right now this is just a possibility, not sure I am actually going to make the switch. 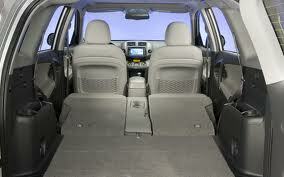 Like I said, I carry my TS in a Highlander and as you see, we have PLENTY of room. Also note another item I've been meaning to share with you and your readers is that I further customized my seat. I added decorative furniture nails to the banding around the seat. If you remember I had mine customized at a auto upholstery shop and though they did a very nice LOOKING job, the banding was starting to pop off just like it did with the original black. It seemed the staples were not long enough and popping. So, I got the idea about the decorative nails and so far they are working great and gives it an "Easy Rider" look LOL. Next I want to get some purple upholstery spray color the canvas pouch. OK back to transportation. While traveling I have also set the TS in the truck of a Ford Crown Victoria trunk with only dropping the tiller to the lowest position and the lid of the trunk closed with no problem. So, that has been my experience with my Travelscoot and transportation. 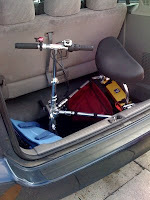 My TravelScoot fits nicely in my 2011 Toyota Rav 4, without folding. 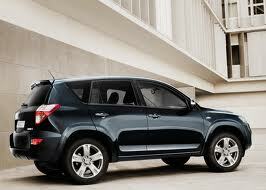 BTW the RAV 4 is excellent for being arthritis friendly for people with painful hands. Below is the DOT regulation regarding airline travel with lithium ion batteries. Up to January 1, 2012, compliance with this regulation has been on a voluntary basis for the airlines. As of January 1, 2012, compliance is mandatory. TravelScoot's single capacity Li-Ion battery contains 24 gram lithium and is approved for air travel. 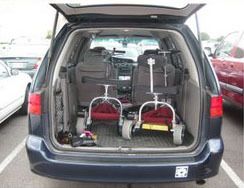 (E) The wheelchair or mobility aid is loaded, stowed, secured and unloaded in an upright position and in a manner that prevents unintentional activation and protects it from damage. (F) A lithium metal battery is forbidden aboard a passenger-carrying aircraft. (B) The lithium ion battery and any spare batteries are carried in the same manner as spare batteries in paragraph (a)(18) of this section. (C) The lithium ion battery and any spare batteries are carried in the same manner as spare batteries in paragraph (a)(18) of this section. (ii) For a lithium-ion battery, an aggregate equivalent lithium content of not more than 8 grams per battery, except that up to two batteries with an aggregate equivalent lithium content of more than 8 grams but not more than 25 grams may be carried. I am impressed. 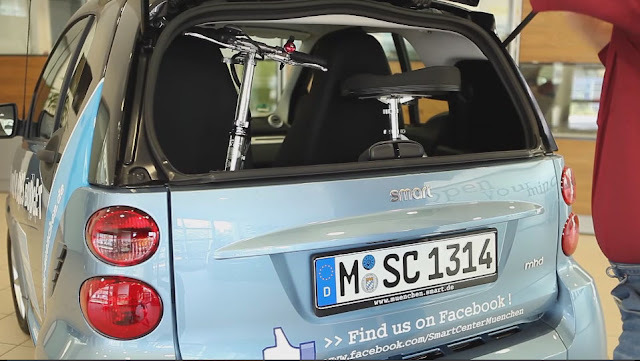 The TravelScoot fits in the SMART car, unfolded! 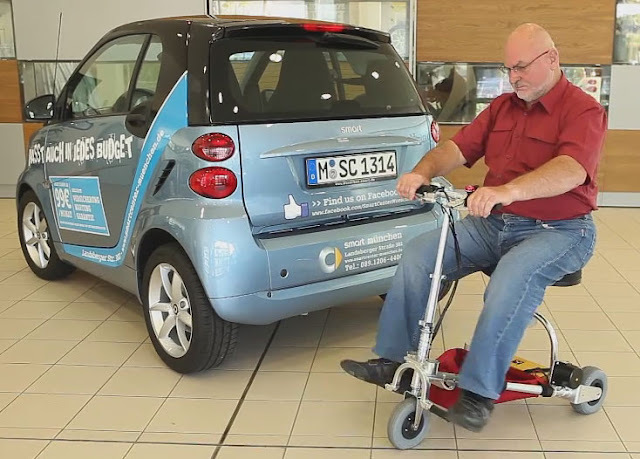 Click HERE to view a video of Hardy Huber, TravelScoot inventor, loading his scoot into a SMART car. What vehicle do you carry your TravelScoot in? Hi everyone. I'd like to do a blog post about transporting the TravelScoot and it's true that when it's folded up it will fit in any vehicle (at least any I can think of), but if you're carrying yours without folding it up, what vehicle are you putting it in? Please tell me the make, model and year of the vehicle, and if you have a picture of your TravelScoot in it, that would be wonderful! You can either post it in the comment section or send me an email, elizabeth@ifisher.com. Both the pictures are of a TravelScoot in the back of our 1999 Honda Odyssey. In the first one there are two TravelScoots and the back seat is folded down into the floorboard. The van will seat 4 people in this configuration. In the second one it's in the back well, and the van will seat 6 people.